Surrounding the area of Ermioni, there are some wonderful sandy beaches where one can enjoy swimming and sunbathing. Ermioni itself does not have any recognised beaches, only small natural coves that offer rock-bathing and swimming in the clear blue sea. These coves can be found along the Southern side of the Bisti peninsula and at both far sides of the Mandrakia waterfront. Venture slightly further, past the Michalis taverna, and you will see some steps leading down to the sea, where one can usually swim without anyone else being around. If it is sandy beaches that you really want, then the surrounding areas of Ermioni offer some beautiful beaches, bays and coves. With the clear blue Aegean sea, these beaches are perfect for swimming or just relaxing. There are beaches, coves and bays to suit everyone’s requirements, whether you require refreshments, snacks, sun-loungers and amenities, or just a quiet natural beach all to yourselves to enjoy peace and tranquility next to the sea. 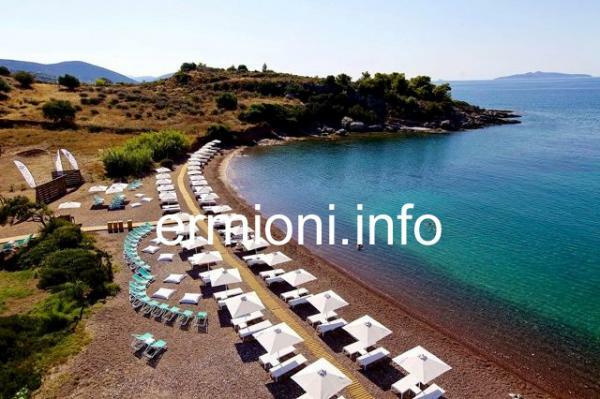 Below are some beaches which are very popular with local residents and visitors to Ermioni. Lepitsa beach (14 kms from Ermioni) is popular with visitors and locals alike, especially busy during July and August. The waters are crystal clear and shallow up to 60 metres. Ideal for young children, with many shaded areas. Sun lounges and parasols are available for a small daily charge. The beach has a fish taverna and a snack-bar, which serve good food, cool drinks and ice-cream, plus other amenities. Lepitsa SunSet situated behind the sandy beach, also offers snacks and ice-cold drinks. Kilada beach (13 kms from Ermioni) is the village beach for the Kilada locals. It is located at the far end of the village, past the very large church. It is a sandy/pebble beach with free loungers and has a wonderful view of the privately owned Koronida island. There is a small cafe/bar just across the narrow road from the beach. Doroufi beach (17 kms from Ermioni) is a quiet shingle beach off the beaten track. The water is shallow for approximately 20 metres. There are no amenities on the beach, except for peace and tranquility. Further West of Doroufi are the small quiet bays and beaches of Lakkes and Thini. Franchthi beach (20 kms from Ermioni) lies opposite Kilada and Koronida island and is very quiet. It is a sand and shingle beach with no amenities, apart from a few straw parasols that offer some shade. Enjoy a walk along the coastline, as at the far end of the beach, there is a narrow footpath which leads to the famous pre-historic cave of Franchthi. Further North of Franchthi are the beaches of Aghios Ioannis and Salanti, which have remained a secret to many visitors. Godai beach (6 kms from Ermioni) is a relative newcomer onto the local beach scene. The beautiful sandy-pebble bay has always been there, but the Godai tourist facilities have transformed this quiet peaceful bay into a lively, if occasionally noisy, popular tourist hotspot. Sun loungers and parasols are available at a cost, but the location itself offers everything a visitor would want. Kouverta 'Blanket' beach (6.5 kms from Ermioni) has a few basic amenities in the summer months, including a beach cantina, and offers shade on the sandy-pebble beach. There are many places to relax and swim from either side of this beach. On the road behind the beach, there's a cafe that is open in the summer months, which has a swimming pool and children's play-area. Lena Mary beach (9 kms from Ermioni) is a French all-inclusive hotel complex, with non-paying hotel guests being allowed on the pebble and sand beach only. Sun loungers and parasols are available. Petrothalassa beach (10 kms from Ermioni) is a small sand and pebble beach with no amenities, apart from a few fishing boats. Located on the Western side of the Club Ermioni hotel, it has very quiet surroundings, but does get busy at the weekends, national holidays and during the months of July and August. Kounoupi beach (20 kms from Ermioni) is a secluded sandy beach South of Petrothalassa, close to the church of Aghios Spiridon. It is a sand and small pebble beach, accessed by stone steps and used by a few local residents (pictured above). Porto Heli beach (20 kms from Ermioni) has a narrow sandy beach with facilities for many water sports, located close to the town centre along the coastal road. Also at Vervaronda there are a number of long stretches of sandy beach, with many amenities. Hinitsa beach (22 kms from Ermioni) is sandy and has a clean lawned area for non-hotel guests. The shallow water is an ideal spot for young children. Sun lounges and parasols are available at an extra cost. In high summer this beach does get very busy with hotel guests. Close by, within walking distance, is a second smaller sandy beach with taverna and bar facilities. Kosta beach (24 kms from Ermioni) has a small clean sandy beach, with a taverna located along the beach front. Kosta is where one can catch the small taxi boats or larger ferry boat for the short sea-crossing to the island of Spetses. Dardiza beach (4.5 kms from Ermioni) is a pebble shingle beach where many local and visiting Greeks go. Situated alongside the main road, it has a small mobile cantina during high season offering cold drinks and hot snacks. Offers shade and seating. Makis Inn beach (10 kms from Ermioni) has beautiful paved surrounds, restaurant and other amenities. Being privately owned, all visitors must order their refreshments from the bar/restaurant which offer friendly waiter service. The beach is cleaned each morning. Porto Hydra / Plepi beach (13 kms from Ermioni) is a privately owned hotel/timeshare complex, where many people have their summer houses and timeshare properties. Many facilities are available which include swimming pool and children’s play area. Charges for non-resident guests can be expensive, especially for drinks. The beach is clean and has been awarded the European 'Blue-flag' in recent years.